ROWERS must have a US Rowing Waiver a Code of Conduct and an attendance agreement on file. NO BUS. Coaches and Captains will help coordinate carpools… ROWERS are NOT allowed to drive themselves to this or any other regatta. ROWERS may not leave the regatta site during the event. Rowers must stay til the end of the day. Once the trailer is loaded and the camp site is cleaned up rowers will be dismissed by coaching staff. Volunteer SIGN-UP GENIUS: We need help! sign up here. NEW THIS REGATTA! 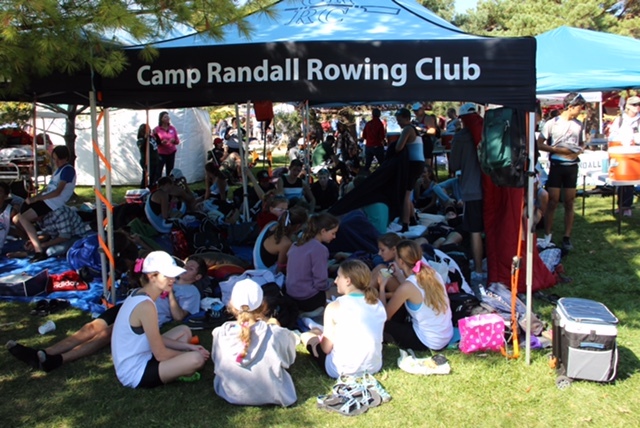 Spectator Lunch SIGN-UP GENIUS: Bring $5/person donation (the day of the regatta) and CRRC provide lunch for you. You MUST sign up ahead of time so that we have ample food for rowers and spectators. Fun Fact! Adults from CRRC also row this race. Cheer on WeCanRow and the adults who row out of the CRRC boathouse. Location: You can use 200 Y Blvd., Rockford, Illinois as your GPS/map address. This head race begins at Martin Park and ends 2.75 miles later at the YMCA log lodge. It’s a great venue for bringing your bike…you can pedal alongside the river for most of the racecourse. Spectators and Fans: CRRC will have coffee for you set up at our tents, and usually someone bakes something delicious to share. Stop by and chat with other CRRC fans. Bring chairs, binoculars, a picnic (or sign up for our $5 spectator lunch option) and a full water bottle. Dogs and bikes welcome. Suggested viewing spots are Martin Park, The Symbol, Sinnissippi Gardens, and anywhere along the east bank of the river between Riverside Boulevard and Whitman Street. Weather: Up to date weather information for Rockford, IL can be found here. Breakfast, snacks and a FULL water bottle. Entertainment/activities, homework for non-race time: art supplies, Frisbee, book, card games, etc. 7:30 AM Coaches/Coxswains meeting will begin promptly. Any changes to the regatta schedule will be announced at the meeting. 5:30 PM Approximate departure from Rockford. ALL ROWERS MUST STAY TO LOAD TRAILER AND TRUCK.